President Bush brushed aside an intensifying clamor among retired military commanders for Donald H. Rumsfeld's resignation, saying Friday that his defense secretary enjoys his full support. "Secretary Rumsfeld's energetic and steady leadership is exactly what is needed at this critical period," Mr. Bush said in a written statement that followed continuing efforts by a group of retired generals to oust Rumsfeld from the Pentagon. Political leaders and military commanders have a history of disagreeing over tactics. Abraham Lincoln argued with his generals, as did Truman and MacArthur during Korea. And during the Vietnam war, generals were unhappy when bombing targets were decided by White House civilians, reports CBS News White House correspondent Jim Axelrod. "He went to war with a flawed plan. He didn't account for the hard work to build the peace after we took down the regime," retired Army Maj. Gen. John Batiste, who served as an infantry division commander in Iraq for 2½ years until last November, said on CBS News' The Early Show. "We also served under a secretary of defense who didn't understand leadership, who was abusive, who was arrogant, who didn't build a strong team," Batiste added. Batiste is one of six former commanders who served under Rumsfeld who now say he should be dismissed. The defense secretary has become a lightning rod for criticism of the way the war in Iraq has been run, reports CBS News senior White House correspondent Bill Plante. In an interview aired Friday on Al-Arabiya television, Rumsfeld said he intends to serve the president at his pleasure. "The fact that two or three or four retired people have different views, I respect their views," Rumsfeld said. "But obviously if, out of thousands and thousands of admirals and generals, if every time two or three people disagreed we changed the secretary of defense of the United States, it would be like a merry-go-round." Major Gens. Charles Swannack and John Riggs, both retired from the Army, were the latest to call for Rumsfeld's resignation. Retired Marine Gen. Gregory Newbold called in Time magazine for "replacing Rumsfeld and many others unwilling to fundamentally change their approach." Last month, Army Major Gen. Paul Eaton wrote in The New York Times that Rumsfeld is "incompetent strategically, operationally and tactically." Other calls for Rumsfeld's replacement have come from Batiste and retired Marine Gen. Anthony Zinni. Riggs told National Public Radio that Rumsfeld fostered an "atmosphere of arrogance." Swannack told CNN that Rumsfeld micromanaged the war. "We need a new secretary of defense," he said. "I know all these guys, and they are very apolitical people. I think they have no particular aspirations that they're trying to achieve by now criticizing the Secretary," says CBS News military analyst Jeff McCausland, a retired Army colonel. "I have seen firsthand how Don relies upon our military commanders in the field and at the Pentagon to make decisions about how best to complete these missions," Mr. Bush said in the statement, issued while he was spending the Easter weekend at Camp David, the presidential retreat in Maryland's Catoctin Mountains. Rumsfeld also has said he relied on what his commanders in the field told him. "I think the secretary's comments are disingenuous," Batiste told Early Show co-anchor Harry Smith. "I think he built that plan the way he wanted to, without regard to the Centcom work for ten years to build a deliberate plan." Gen. Eric Shinseki, then the Army chief of staff, told Congress a month before the 2003 invasion of Iraq that occupying the country could require "several hundred thousand troops," rather than the smaller force that was later provided. "And we all remember what happened to him," said Batiste. "He was retired early, and the Secretary of Defense did not go to his retirement ceremony." Military experts say the parade of recently retired military brass calling for Rumsfeld's resignation is troubling and threatens to undermine the strong support Mr. Bush has enjoyed among the officer corps and troops. With public anti-war sentiment increasing, "the president and his team cannot afford to lose that support," said Kurt Campbell, a former deputy assistant secretary of defense. Yet for President Bush to try to distance himself from Rumsfeld "would call into question everything about the last three years' strategy in ways the White House worries would send a very negative message," said Campbell, now with the Center for Strategic and International Studies. President Bush's dilemma, said Michael O'Hanlon, a military analyst with the Brookings Institution, is that the president "shares a lot of the responsibility for the key decisions on Iraq." "Bush is implicated. For Bush to fire Rumsfeld is for Bush to declare himself a failure as president. Iraq is the main issue of his presidency," said O'Hanlon, who supported Bush's decision to invade Iraq and said he still supports the war. 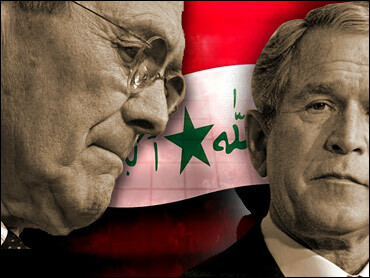 The most nettlesome member of the Bush Cabinet, Rumsfeld has been a lightning rod since the war began in March 2003. He was blamed for committing too few U.S. troops and for underestimating the strength of the insurgency. He took heat in 2004 over the abuse of Iraqi prisoners at the U.S. Army-run Abu Ghraib prison, and for a brusque response he gave to an Army National Guard soldier in Kuwait who questioned him on inadequate armor. The Pentagon has shrugged off the criticism of Rumsfeld. "I don't know how many generals there are. There are a couple thousand at least, and they're going to have opinions," Pentagon spokesman Eric Ruff said. "It's not surprising; we're in a war." But it is surprising, especially because it's a time of war, said P.J. Crowley, a retired Air Force colonel who served as a Pentagon spokesman in both Republican and Democratic administrations and was a national security aide to former President Bill Clinton. "This is a very significant vote of no confidence and I think the president has to take this into account. The military is saying it does not trust its civilian leadership," said Crowley, now a senior fellow at the liberal Center for American Progress. Gen. Peter Pace, chairman of the Joint Chiefs of Staff, has become Rumsfeld's strongest defender in uniform. "He does his homework. He works weekends, he works nights. People can question my judgment or his judgment, but they should never question the dedication, the patriotism and the work ethic of Secretary Rumsfeld," Pace said.